Mandy, please email me your mailing address and I will get your Gift Card out to you. It warmed my heart to read your comments and it made me realize how very much you all mean to me. Many of you have shared with me that you followed my pregnancy and watched my little boy Griffin grow up. That just makes me happy. I've know many of you for SO many years ... and some of you are newer friends. I am a lucky, lucky girl to have so many wonderful online friends. Thank you for playing ... we'll do this again soon. Today I am celebrating my 1,000th blog post with a fun give-a-way! I have a $20.00 Target gift card to share with one lucky person! 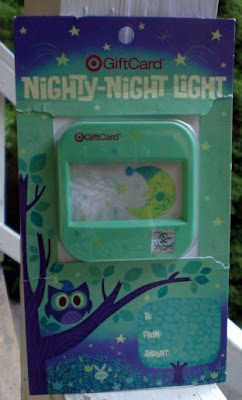 This isn't just any 'ole gift card mind you ... it's an Owl Nighty Night Light gift card! To be entered to win the $20.00 Target gift card all you have to do is leave a comment on THIS post. In your comment please share with me how you found my blog. I will accept comments through Monday, June 29th. On Tuesday, June 30th we will put everyone's name in a hat that left a comment and choose ONE winner. The winner of the gift card will be announced right here on my blog. If you would like to share this give-a-way with your blog readers please feel free to do so!! Look What's New ~ Custom Teddy Bear Names! Seems like I've been bitten by the creative bug ... and I hope it keeps biting! Look what's new ... Custom Teddy Bear Names! They are great for scrapbooking, card making, gift bags and you can even frame them! This is what the completed project looks like. You will receive the individual pieces you see below to make the completed project. It's easy ... all you have to do is assemble the pieces on your page as you wish and voila ... instant cuteness! If interested please visit MY EBAY STORE to find them! It's A Sweet Sweet Summer. Griffin is attending Vacation Bible School this week at his preschool. He enjoyed the first day very much. He came home with a big stack of art projects ... he LOVES doing art! We were thrilled to see our friends Keisha and Darius there. We invited them over for lunch and a little playtime at our house and happily they said they would like to come. Although in this picture you can not really tell, Griffin was playing "helicopter" with the swing. And we all took a little buggy ride down to the farm. It was a GREAT day ... we are definitely having a sweet, sweet summer. Yesterday when we went outside we discovered we have hundred and hundreds of "froggy fish" ... otherwise known as tadpoles! Take a look at this cute video to see Griffin discovering them for the first time. I would like to wish all of the Daddy's out there a Happy Father's Day! 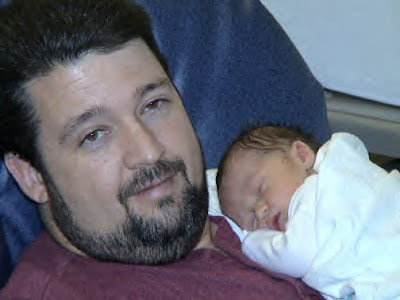 This is a picture of the day Mike became a father to our sweet Griffin, February 7, 2005. I was able to pick two squash from our little garden ... it wasn't quite enough to serve for dinner so I decided to pick two more up from the grocery store for a family sized portion of sauteed squash and onions. When I got home and looked at the two I purchased ... I realized our two home grown squash were much prettier than the two I purchased from the store. Maybe I'm a little biased ... what do you think? Our home grown squash are on the left. We enjoyed a fabulous day at the pool yesterday ... the sun was shining, the birds were singing and the kids were splashing. Griffin enjoyed playing with friends from preschool, he had a blast! Griffin with Megan and Anna ... they played together for hours. Here they are playing follow the leader. After playing so hard ... it was time for a rest so they decided to sun themselves on the side of the pool. Go to your refrigerator, open the door, take a picture exactly as your refrigerator looks right now. Don't move anything around. Post your picture and share what's in there. Lots of cold cuts, cheeses and alot of cheese sticks. Mike worked at a plant and they sent a whole case of cheese sticks home with him. Lettuce, Leftover taco fixings (we had that for dinner last night), leftover yellow rice, and our bread. I've been keeping the bread in the refrigerator lately because it tends to mold easily during the summer months. Condiments, our creams, a 3rd (yes 3rd! gallon of milk), Diet Pepsi, Diet Sierra Mist and Apple Juice that Griffin will not drink. That's it folks ... are you up for the challenge? The first week they created these cute little pictures using their fingerprints. Yesterday they painted frames to put the little pictures in. And on Sunday Griffin will be able to proudly share his handmade gift with Daddy. Handmade gifts are just the BEST!! It didn't dawn on me that it was her birthday until I visited my sister-in-law Bonnie's Blog. Thanks for the reminder Bonnie! 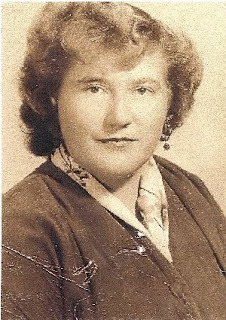 My Momma (Syble) died far too young. She was able to celebrate 43 birthdays ... I wish she were still here today to celebrate her 76th birthday with us. One day last week I was sitting at my scrapbook table and a new line of paper piecings just "came" to me. I sat there and created my new Teddy Bear Scallops Paper Piecing line. It was if they were meant to be! Today I am so, so happy to be able to share with you my newest venture ... my Sweet Paper Flowers Blog! You can see some of my newest items including my brand new Teddy Bear Scallops and some of my most popular paper flowers! I plan to add more to my Sweet Paper Flowers as time allows. Today if you have a moment, won't you please stop by to see what I have available? Just CLICK HERE to go there! Did my blog title get your attention? LOL ... no silly ... I'm not the celebrity ... but I am watching this show on NBC called "I'm A Celebrity Get Me Out Of Here". I can't believe I'm admitting to watching this show ... but hey, a girl has to have something to blog about right? This is probably one of the silliest show I've ever seen. It's one of those things that SO bad I just can't turn it off. Janice Dickinson the "first supermodel"
The celebrities are in the Costa Rican jungle for three weeks. They have challenges such as eating bugs and looking for stars in snake/alligator/varmint infested waters. They are doing this all in the name of charity. It's one of those shows that I watch by myself because Mike doesn't like it. Will anyone else admit to watching it? Griffin has avoided getting a "real" haircut for a couple of months. The last time we trimmed his bangs and around his ears was Easter Sunday. He was beginning to look a little bit like Shaggy ... so Sunday night Mike whipped out the clippers to give him a trim. Well ... we decided to go all out and give him a new, fresh summer 'do! He has very thick, straight hair. I always like when he has longer hair ... but I tell you ... with this new haircut ... I'm thinking shorter is better! I haven't been the best blogger lately ... seems like I've had less time to blog, visit other blogs and even leave comments. I miss it. So, today ... I'm back to blogging. A "real" post, if you will. Oops ... after loading all of my pictures I realized I did them small instead of large. The other day our friends Carol, Hannah and Sam came over. The kids decided to make a cake ... and Griffin declared it "The Best Cake EVER". It was time to ice the cake. The boys quickly tired of that and decided to clean their butter knives. What's a cake without candles? And finally ... we got to eat the BEST CAKE EVER! Cute ... Cute ... Cuteness! I actually do have some things to blog about ... but I wanted to share just a few more of my new Teddy Bear Scallops With Paper Flowers with you. These can all be found at my Ebay Store and all you have to do is CLICK HERE to go there! I love all things Americana and the red, white and blue. This sweet American Flag Teddy Bear Scallop is my new favorite!! It's watermelon time ya'll ... loving that the summer is here and it's time to enjoy this delectable, sweet treat! Okay ... so most of you know fall is my absolute favorite time of year. Even though it's summer I *had* to make an Autumn Pumpkin Teddy Bear Scallop. Please pop on over to MY EBAY STORE to see these and many, many more cute items!! New Missy Made It! Paper Piecings. Look what's new at Missy Made It! If you see something you like ... you can find them in my Ebay Store!